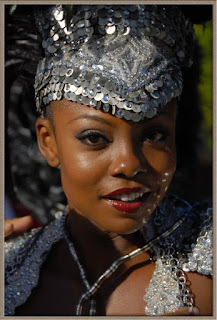 Wendy Fitzwilliam is a former Miss Trinidad & Tobago Universe as well as Miss Universe. 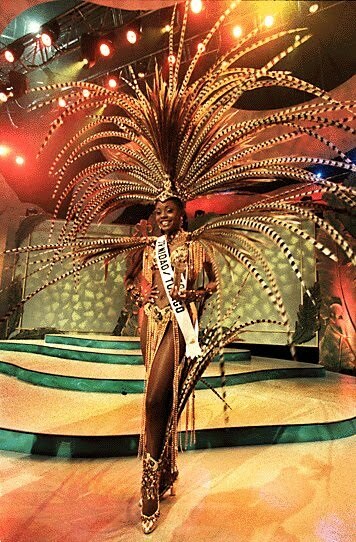 At 25, she won the 1998 Miss Universe competition held in Honolulu, Hawaii. She became Trinidad and Tobago's second winner of Miss Universe after 1977 winner Janelle 'Penny' Commissiong. Coincidentally, Commissiong was also the first black woman to capture the Miss Universe title, while Fitzwilliam was the second. .... And good-gosh, Wendy Fitzwilliam is an ethereal beauty, whether she is gliding through a fete in Trinidad or taking pictures in costume on the road. She is stunning! Her voice and smile ... charming! She has the same effect that model, IMAN had on me many years ago. So when I saw the Facebook WENDY FITZWILLIAM FAN PAGE, I joined! Since I have shared a few posts on belly dancing, check out the former Miss Universe in a belly dancing class last evening. I hope Miss Fitzwilliam does not mind me sharing her video. Just promise me that you will show support and join her fan page! PLEASE. LOL! I totally agree with this post. I too joined her FB page when I came across it. 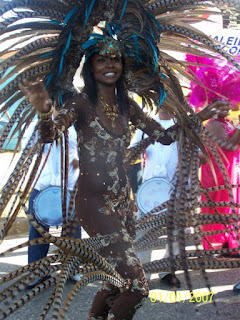 When she is in a fete she seems to be floating, she is such a beautiful, classy lady.